If you’re big into theater, chances are you’ve heard of Buddies in Bad Times Theater. Operating since 1979, the theater has brought alternative theater to Toronto while giving a voice to queer performers and queer stories. Over a million people have stepped through the theater’s doors in the Church and Wellesley village, one of the community hubs for the Greater Toronto Area’s queer community, and Buddies in Bad Times is open year-round. I got a chance to go to Buddies in Bad Times a few weeks ago, and while I won’t write about that experience (I don’t want to spoil the show for anybody), I do want to talk about such an important leader in queer theater. One of the things that Buddies in Bad Times is most proud of is the fact that they are the oldest queer theater in the world! 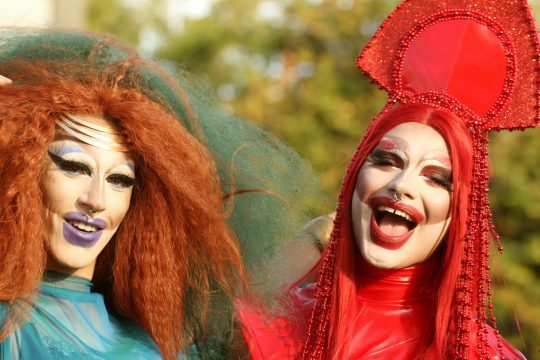 Over the last 40 years, they’ve brought over 1000 new shows to the community, with dedication to making their work accessible and representative of all queer voices. Have you ever thought about seeing a show about a queer Muslim woman who dates other women? What about nonbinary aboriginal youth who cannot afford to exist above the poverty line? Buddies in Bad Times celebrates diversity, whether talking about race, religion, class, or disabilities. Their shows are not diverse just for the sake of tokenizing people—they are real theater-worthy shows that take the audience on a ride, rivaling the shows of even larger theater companies. Another great thing about Buddies in Bad Times is that they function as both a bar and a theater, allowing for a space for sobriety as well as a space for those who wish to drink! On weekends, the theater hosts all sorts of events to raise money for the theater’s activities in the city: past events have included drag queen competitions, dance parties, and film screenings! There’s something for everyone at Buddies in Bad Times, and if you’d like to find out more, check out their website here!